It all begins with the script. The script defines the world of the play establishing the setting, the characters, and the action. Reading the script or analyzing the score in the case of a musical or opera is the first entry into what the props will be for the production. The first read of the script should be for a basic understanding of the story- who are the characters and what is happening in the play. This read is critical to having a framework of understanding of the flow of action and an overview of the literature. On the second and third read through finding the details becomes more important. Where is the play set? (City, building, specific room, country) When is the play set? (Season, time period, time of day, holiday time) Who are these characters? (Jobs, economic status, social status, relationships, passions, fears, religion, family group) What happens in the play? (Actionable event, supporting events). RUTH: (Leading her to sofa) Well, of course you're fine. Now, you sit down right ...(seats her)...there. Would you like a cold washrag? RUTH Here you go. You nibble on this and you'll feel a lot better. (Puts the plate down next to her) I know what I'm talk about. (Sarah takes a piece of toast and takes a small bite.) You just sit right there and eat your toast. SARAH: I like your house. You've got real nice furniture. RUTH: Thank you. Mostly odds and ends. This table, though...I'm fond of this table. This one. It belonged to my mother. All hand carved by her brother. (She touches it lovingly.) And these two chairs are from her dining room. There were eight of them and we- my two brothers and my sister, myself- each took two. I got the two with the side arms. RUTH: (Moving to a picture) This is my family. RUTH: (Picks up the picture and moves to Sarah) It was taken not long before my mother died. She was a really beautiful woman all her life, but...cancer. (Looks at the picture and shakes her head, then more brightly.) This is my sister Leah-she lives in California- and this is my brother Wendall- he lives here in Masefield, runs the post office- and this is Justin, my brother, her lives two houses down. I think Tyler looks just like him- same chin. SARAH: Is that you in the back? RUTH: (Laughs) Yes. I had everyone standing in front of me because I was eight months- It was right before Tyler was born. (Putting the picture back in its place.) I must get a new frame for this. These sixteen lines alone pulled from the script give valuable hints into many things impacting prop choices. The kitchen is immediately adjacent to the living room since the toast can be so quickly fetched and so the house is small. This size perception is supported by the comment about the heat from the stove. This will probably impact the scale of furniture and even require some "kitchen" dressing support seen through a doorway. The toast must be brought in on a plate (hand prop). We know some of the furniture now... she lies down on a sofa and the toast is set on an adjacent table easy for her to reach, so probably a side table or coffee table of some kind. From the next conversation we get the sense the furniture is hand-me-down but nice. It should not match. One table is quite specific in description requiring hand carving. The chairs must be dining room chairs with arms. The photo (hand prop) is also quite specific. It is a framed family photograph with at least five people in the picture. Two of the people are men, three are women- one elderly and one pregnant. The final line suggests the frame may be "dated" but it could also simply be a way of changing the conversation and nothing is really wrong with it. Script analysis is not always a literal description. From these sixteen lines we also begin to see the characters and understand what their world might look like. As the script is read, underlining or highlighting the props, making notations in the border, or writing questions about something occurring in the action impacting the props is the start of organizing a way of thinking about the show and preparing to talk with the designers. Understanding the script prior to the first production / design meeting is critical to participating as a collaborative and supportive partner in the design process. While the director and/or designer may chose to move time period or alter the convention of presentation in other ways, knowing the initial script establishes the foundation for moving into a different interpretation. Finding and reading the same translation or revision being produced is critical to effective preparation and will certainly impact the prop list preparation so it is always wise to ask for the specific script information. This information should be compiled into a preliminary prop list to use in the production and design meetings as the show begins it’s build process. 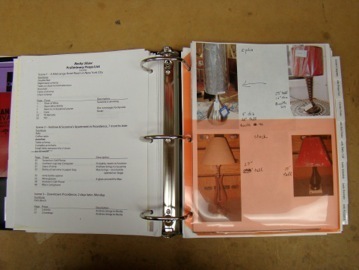 From the preliminary prop list, the prop staff can begin to do research on the various items needed for the show. The research information and images provide a visual communication tool utilized with the designer to select what the prop look like. Often designers will pick and chose pieces of images to create a specific “new” image. The designer may communicate this information through a specific prop drawing, a collage style representation, or simply via verbal description based on a review of the available research, leaving the actual documentation process to the properties director. Compiling those images into a collage connected to a specific prop on the prop list gives the prop shop a way to direct the build on each item. It assists the budgeting process and defines the shopping priority for props that may need to be purchased or for defining the look of the fabric, trim, hardware, or raw materials necessary to purchase for an item that has to be constructed. All research images/collages are assembled and stored in the show “bible” for access by the prop shop staff as necessary during the build. During the process of the build, when a question arises about how something should “look”, the best answer usually is available by reviewing the research materials and designer notes. Retaining show research along with the designer’s notation and any in-progress shots pertaining to the prop in the prop “bible” for documentation of the build is helpful for those shows which may be re-mounted at another theatre, sent out on tour, or which are seasonal shows for annual remount such as A Christmas Carol. Having the source material makes additions to the show or replications in case of breakage or need for duplicates easier. It also allows the evolution of a prop to be tracked over several seasons when a different director utilizes the same scenic design for a seasonal show but needs to alter the props to fit that version. 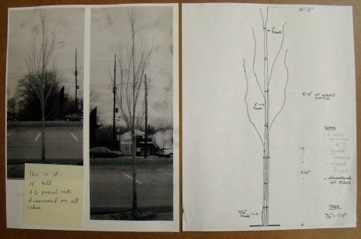 Photo research and designer drawing for prop “tree” Courtesy Actor’s Theatre of Louisville prop shop. 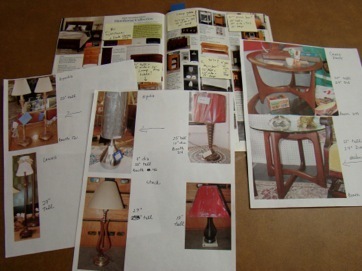 Prop collage of possible choices for furniture choices from shopped items, stock, and catalogs. Courtesy Actor’s Theatre of Louisville prop shop. Show “bible” with prop list, rehearsal notes, and research images. Courtesy Actor’s Theatre of Louisville prop shop. The pre-production script analysis and research give a foundation for the discussions and considerations during the entire build. As the properties director becomes engaged with the show and the particular interpretation and design statement determined for this production, all of the information coalesces. This knowledge gives the properties director an armada of information on which to offer better choices and to make appropriate decisions. As the prop shop begins the show build knowing the script and understanding the historical and stylistic foundation, every choice becomes easier and the shop can make the decisions to best support the designer's vision.